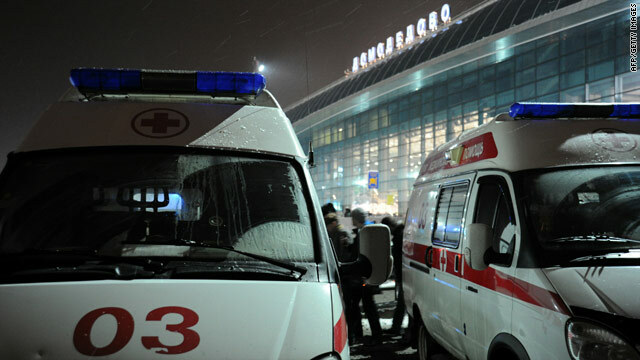 Officials: Bombing at Moscow airport kills 35: A suicide bomber attacked Moscow's busiest airport on Monday, killing 35 people and wounding about 100, authorities and state television said. Oprah Winfrey has a secret sister: Oprah Winfrey revealed on her television show Monday morning that she has a half-sister she knew nothing about. 2 officers killed, man found dead after shootout inside Florida home: A wanted Florida man shot and killed two St. Petersburg police officers Monday morning, and later the apparent assailant was found dead after police used a backhoe to tear through his house, authorities said. 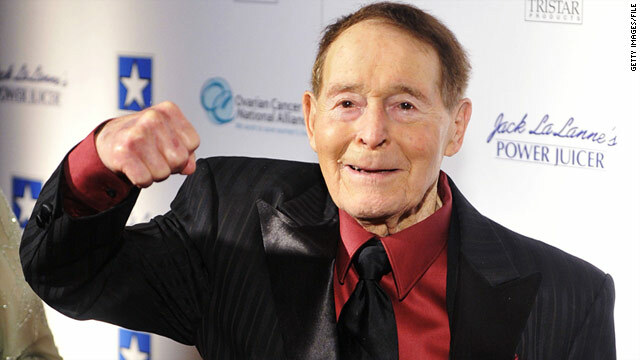 Fitness guru Jack LaLanne dies at 96: American fitness guru Jack LaLanne died Sunday afternoon at his home in Morro Bay, California, according to his long-time agent, Rick Hersh. He was 96. Malcolm Gladwell, master of explanation: In his books, Malcolm Gladwell puts his ability to question many of the things we think we know on display. 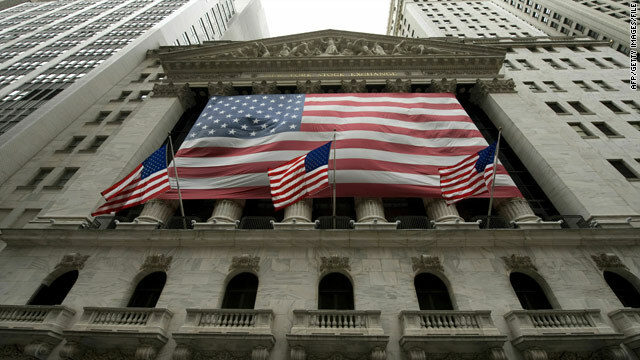 Stocks got the week off to a solid start Monday, with the Dow slowly clawing its way toward the 12,000 mark. The Dow Jones industrial average closed at 11,980, up 109 points, or 0.9% from the prior trading session. The blue-chip index has been on an upward trend since Thanksgiving, and is now within a stone's throw of 12,000 - a level last seen on June 18, 2008. Flavor Flav is looking to "blow up your taste buds, man." Look out, Colonel Sanders. Flavor Flav has a fried chicken restaurant, and he's coming for you - starting in a small Iowa city. The Public Enemy rapper and reality TV star opened Flav's Fried Chicken in Clinton, Iowa, on Monday with a business partner he met through a connection in Las Vegas, the Clinton Herald reported. "My chicken ain't no joke. 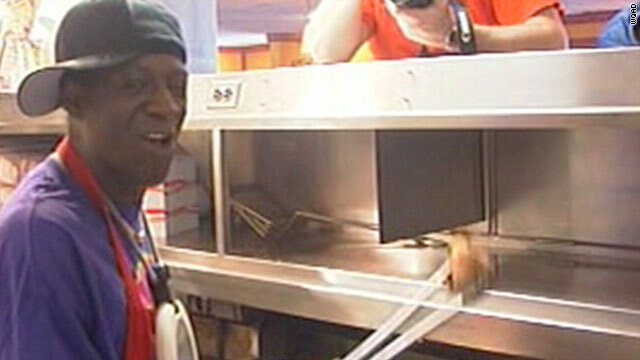 I ain't scared to go up against the Colonel, tastewise," Flav said, referring to chicken giant KFC, in a YouTube video of him frying chicken at Monday's opening. "You're going to find me in here working. … You're going to catch me in here seasoning up my chicken, flouring up my chicken, frying up my chicken. And not only that, but coming out here and serving my chicken to people," he said. The idea for the venture came after Flav befriended Las Vegas restaurateur Peter Cimino. Flav cooked Cimino some chicken, and Cimino, duly impressed, had Flav sell his chicken wings at Mama Cimino's Pizza in Las Vegas, the rapper told northern Illinois news site SaukValley.com. It was Cimino's brother, Clinton restaurateur Nick Cimino, who suggested he and Flav open a fried chicken restaurant in the Iowa city of roughly 26,000 people. 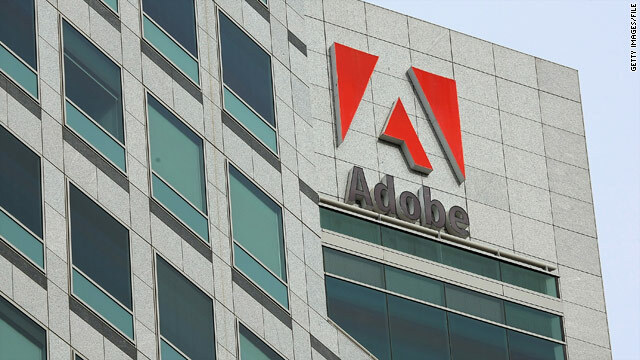 Adobe Systems is among the Fortune magazine "100 best companies to work for" with at least 700 job openings. They're hiring! : Twenty-five of Fortune magazine's "100 best companies to work for" have at least 700 openings each, totaling nearly 137,000 jobs. What are they looking for? Here's what Goldman Sachs looks for in a job candidate. End of credit cards is coming: You can already use your iPhone, Droid or BlackBerry to buy a hot dog at the ballgame, buy your Starbucks latte or give a friend a few bucks. By the end of the year, credit cards may be obsolete. 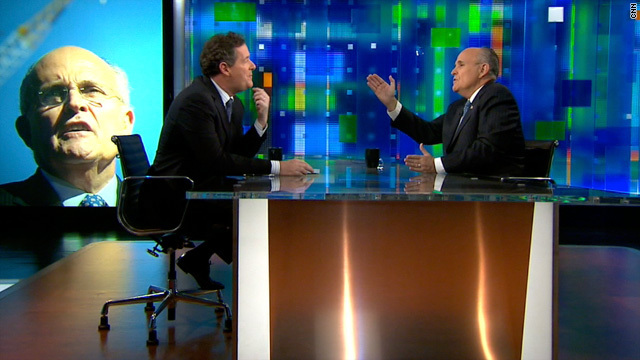 Former New York Mayor Rudy Giuliani talks to CNN's Piers Morgan. Rudy Giuliani, the former New York mayor and 2008 Republican presidential candidate, talked Tea Party, taxes and the best (and worst) day of his life in a lively interview with CNN's Piers Morgan that airs at 9 ET Monday night. Overall, the Tea Party is a "good" movement, Giuliani said, but it has also attracted "a couple of people that are a little crazy ... "
When he first launched his bid for the White House several years ago, he recalled that "there was a big anti-war movement in this country against the Iraq War, people hanging President Bush in effigy, people saying President Bush should be killed." "Well, those people weren't the core of that movement," he said. "The core of that movement legitimately opposed the war in Iraq. I didn't agree with them, but they had every right to do it. They were very emotional. They're very angry. But they were respectable people who opposed it, with some extremists who made them look bad. The Tea Party, the same thing - respectable people. They have a legitimate political point. A couple of people that are a little crazy who take it to an extreme." Will the Tea Party help or hurt the GOP's odds of taking the White House in 2012?
" ... If they keep us on a strict focus on economic issues, they'll help us a lot. If they take us off on other issues, then you just - you just don't know, they could hurt us," Giuliani said. Morgan also asked if the ex-mayor would raise taxes if he were president. Giuliani said he would not. He answered that he would rather cut expenses, and he compared what he did in his time as mayor to what he would do in the Oval Office. "When I became mayor of New York City, I had a $2.4 billion deficit and everybody wanted me to raise taxes. I said if I raise taxes, I'll drive people out of New York City and then I'll be raising taxes again. So what I did was I cut expenses by 15 percent. I cut everything but the police department, because I had too much crime. I cut schools. It was very unpopular. I mean, I cut every single thing - things that I thought were good and things that I thought were bad." 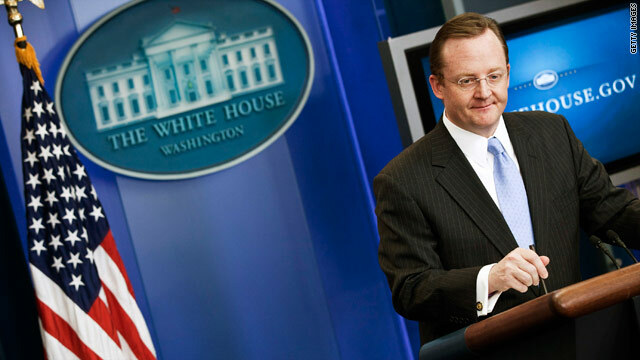 He said federal spending must be cut "to the level of realistic federal revenues." Morgan asked Giuliani to describe his best day. Giuliani talked about September 11, 2001. "I don't think I ever saw more heroism, more, just, tremendous outpouring of love, people to people," he said. "And when I say 'day,' I mean period of time. You know, you showed a picture of Hillary Clinton and me there. You know, people couldn't imagine. I imagine that Hillary Clinton - and particularly at that point - and me could work together," he said. "And we worked together very, very, very closely." For a moment in time, Giuliani said, "there were no Republicans, no Democrats, just - just trying to help people. ... In a way, it was the worst and the best - and the best day, largely because of the way the people - the people reacted." In a lighter moment after the interview with Morgan, the New Yorker predicted how the Yankees will do in 2011. Slim Amamou, Tunisian minister of youth and sports, arrives for a ministers session on January 20 in Tunis. The dissident blogger said he was being psychologically tortured in Tunisia earlier this month, according to several media outlets. He was reportedly told that screams emanating from beyond a wall in an Interior Ministry office were the cries of his family members being tortured. Today, Amamou is Tunisia’s minister of youth and sports – a fitting role reversal for a cog in Tunisia’s lightning-fast, social media-fueled revolution. The 33-year-old CEO of a Web development company was arrested January 6 with another blogger and accused of being part of a conspiracy to destroy government sites, Al-Jazeera reported. He was released January 13, the day before President Zine al-Abidine Ben Ali fled the country. Minutes before the Cabinet was announced, Amamou was offered a position in the interim government, Al-Jazeera said. He has since been using his blog as well as his Facebook and Twitter accounts - the same weapons he used to sound off about government abuses and his own arrest - to send out reports on the new government, even on closed-door meetings, The New York Times said. His postings are in French, Arabic and, sometimes, English. His first conflict with the Constitutional Democratic Rally, Ben Ali’s party, was over his failure to wear a tie, The Times said. He also caught some flak from his followers when he said the members of the president’s party shouldn’t be rejected from the government. It’s a coalition government, he wrote, so people won’t be in total agreement over its makeup, The Guardian in London said. As for criticism aimed at his transition from revolutionary to minister, he said it is not a career move. He is doing it for his country and to keep an eye on the interim government until elections can be held. He also wants to persuade other Cabinet members to sign up for Twitter, The Times reported. “It is similar to an underground artist who signs with a major label and is criticized by the purists and the masses,” he wrote, describing the criticism. 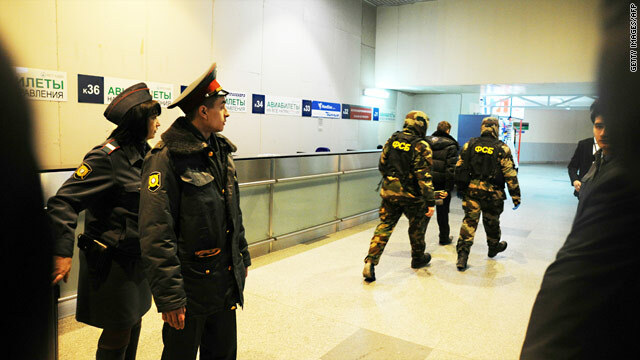 Russian authorities rush inside Moscow's Domodedovo Airport shortly after Monday's explosion. 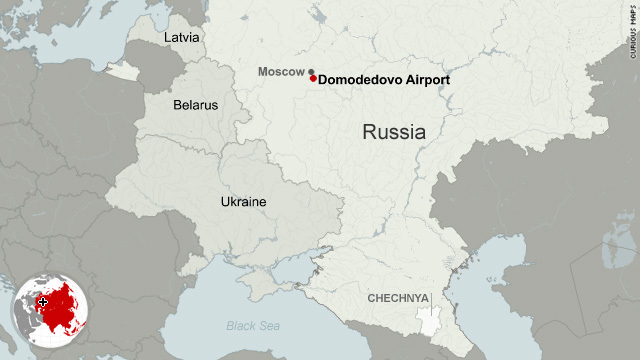 The scene at Moscow’s Domodedovo Airport became so chaotic that airport staff had to break through a wall to let frightened passengers leave, a witness said. Tatyana Popova, speaking from the departures area, said she was waiting at passport control when she heard the blast. Monday's explosion - which Russian authorities have attributed to a suicide bomber - caused smoke to course through the baggage claims area, she said. “There were a lot of people crowded there because the escalators stopped,” Popova told the Russian station RT. “The staff organized (an) emergency exit, but the door was very narrow and people crowded there immediately. So, the staff started breaking the wall to let the people out." Footage released on YouTube by Russian state TV showed several police in a smoke-filled section of the airport. There were several bodies and pieces of luggage lying on the floor, and video from another part of the airport showed paramedics rushing by with people on stretchers. 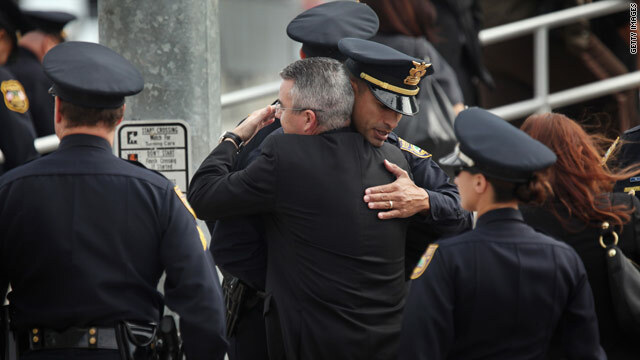 Law enforcement officials hug each other Monday before a memorial service for two slain Miami-Dade police officers. As police in Florida prepared for the funeral of two Miami-Dade County police officers gunned down in the line of duty, shots rang out Monday in St. Petersburg, on the other side of the state. Two other officers fell dead and a federal marshal was wounded. Follow updates on CNN and affiliate WFTS-TV. On any given day, such violence against police officers would be disturbing. But the fatalities capped a particularly violent 24 hours in the United States for the men and women in blue. Eleven police officers were shot. It is natural to search for answers, Johnson said, even if there aren’t any. The shootings do not appear to be related, and the motives may never be known. Declaring it to be open season against police officers seems dangerously simplistic, he added. He sees the shootings more as acts of desperation. 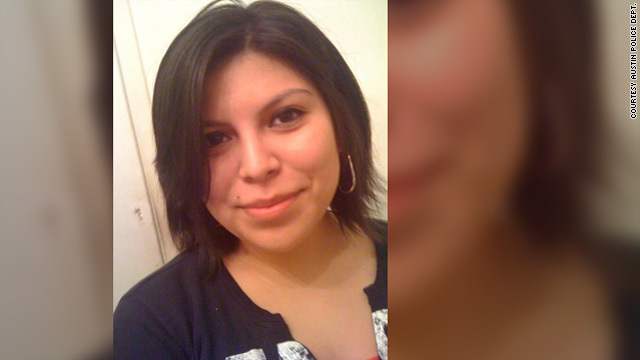 Julie Ann Gonzalez of Texas went missing in March. Nancy Grace's new show, "Nancy Grace: America's Missing," is dedicated to finding 50 people in 50 days. As part of the effort, which relies heavily on audience participation, CNN.com news blog "This Just In" will feature the stories of the missing. On Monday, the show looks at 21-year-old mother and pharmacy technician Julie Ann Gonzalez. Her estranged husband, George De La Cruz, saw her last on March 26 when she picked up their daughter. Two days later, police found Gonzalez's vehicle abandoned in a Walgreen's parking lot in south Austin, Texas. She has not been seen or heard from since then. A woman suspected of snatching an infant from a New York hospital in 1987 confessed to the alleged abduction, according to court documents filed Monday. miscarriages, said the complaint filed in federal court in New York. 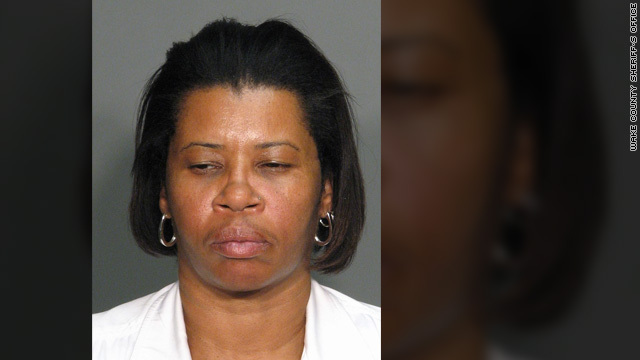 The 44-year-old Pettway turned herself in Sunday morning at the FBI office in Bridgeport, Connecticut, FBI spokesman William Reiner said. Kevin Clash puppeteers Sesame Street's Elmo. Importance of being Elmo – You may have never heard of Kevin Clash, the man behind the legend - Elmo, that is. CNN's Brooke Anderson meets Elmo's puppeteer, a six-foot tall man with a low, smooth and manly voice. Clash is the subject of a documentary debuting at the Sundance Film Festival called "Being Elmo: A Puppeteer's Journey." At least nine homes in the Ohio village of Fairport Harbor caught fire Monday after an increase in gas line pressure, the mayor's office said. Authorities scrambled to shut off gas service amid reports of gas fumes in the air. Lake County Sheriff Daniel Dunlap said that as of about 8:40 a.m., gas service had been shut off and all the fires were believed to be out. serious, charges tied to the Arizona massacre. The arraignment hearing for suspect Jared Lee Loughner is scheduled for 1:30 p.m. MST (3:30 p.m. ET) at the U.S. District Court of Arizona in Phoenix. Loughner, 22, already has been in that court to face charges on three counts of attempted murder in the shootings of Giffords and two of her aides, Ron Barber and Pamela Simon. [Updated at 11:18 a.m.] Russian President Dmitry Medvedev said in a television address that the Monday bombing at a Moscow airport was a terrorist attack. He further said that he postponed his trip to the World Economic Forum in Davos, Switzerland, because of the bombing. NATO condemned the attack and urged greater cooperation in the fight against terrorism. British Foreign Secretary William Hague said British officials are "in urgent contact with Russian authorities to establish the facts and to provide consular support to any British nationals who may have been affected." [Updated at 10:51 a.m.] Footage from inside Moscow's Domodedovo Airport showed several police in a smoke-filled section of the airport. Jack LaLanne was a peppy, iron-pumping, vegetables and fruits devotee who pioneered fitness as a total lifestyle. He opened his first gym when he was still in high school, in 1931, and his television workout show started in the 1950s and ran for 34 years. LaLanne exercised until his final day, according to his agent Rick Hersh. The beloved guru of sweat died at his California home Sunday. CNN has unearthed some charming old film of LaLanne - two old workout videos and footage of his 3-mile swim to Alcatraz, handcuffed. 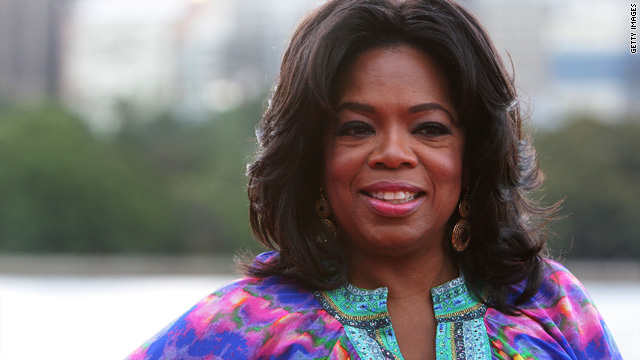 Oprah Winfrey is to reveal a family secret on her talk show Monday. Oprah Winfrey has a half sister who she didn't know existed. Much hoopla has surrounded the queen of talk who has been owning her final season with big interviews and an adventurous vacation Down Under. But her promise to reveal a personal family secret on air Monday may be the ultimate show tease. In a promo for the episode, Winfrey said the secret "shook me to my core." Overnight, there was an overwhelming amount of Web buzz about what the secret could be. "Oprah secret" is one of the most popular Google searches Monday. Most speculation appears to center on guesses about a half sister. 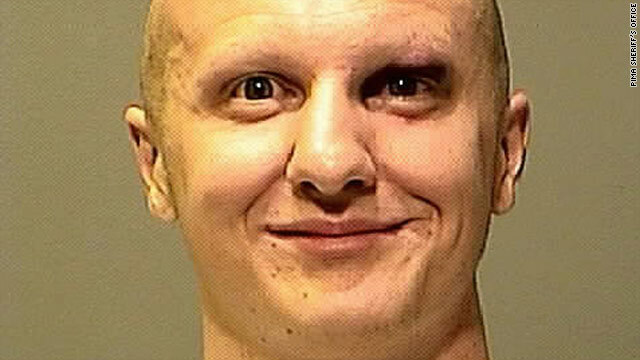 Jared Lee Loughner, 22, is suspected of a mass shooting in Arizona earlier this month. Alleged Arizona shooter in court - The 22-year-old who allegedly gunned down 19 people, killing 6, at a political event for Rep. Gabrielle Giffords will be in court Monday at 1:30 p.m. Tucson, Arizona, time. Jared Lee Loughner will appear before a federal judge to face murder charges. Judge Larry Burns of the U.S. District Court for Southern California, based in San Diego, will preside. All of Arizona's federal judges recused themselves because one of the gunman's victims was Arizona's chief federal judge, John Roll of Tucson. 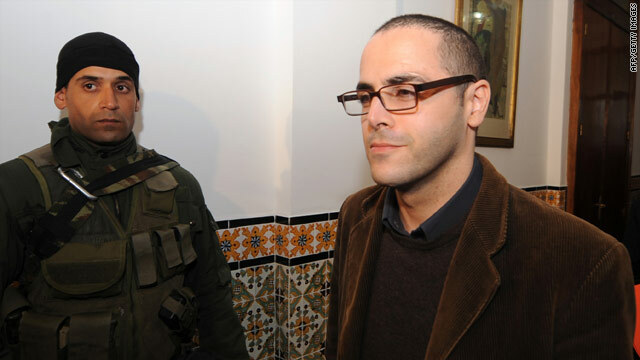 Loughner had already been in court shortly after the January 8 shooting to face charges on three counts of attempted murder related to survivors of the rampage: Giffords, who was shot in the head, and two of her aides, Rob Barber and Pamela Simon. Much has been reported concerning Loughner's apparent odd behavior and other red flags before the shooting. What will Loughner's defense be like? Meanwhile, Giffords' condition continues to improve. She recently began rehab at a Texas facility. Oprah's big secret - Oprah Winfrey has said she will reveal a deep family secret on her show today. Chat rooms and blogs are buzzing about what it could be. She says during a promo for the episode: "I was given some news that literally shook me to my core. ... I was keeping a family secret for months, and you're going to hear it straight from me." "Palestinian Papers" revealed - The Al-Jazeera TV network has published what it says are documents showing that Palestinian negotiators agreed to relinquish large tracts of East Jerusalem to Israel over the past several years during peace talks. The trove of more than 1,600 secret Palestinian papers that the Qatar-based news agency released on Sunday, along with Britain's Guardian newspaper, is not part of a WikiLeaks cable dump. The records detail an "increasingly desperate yet futile effort by Palestinian negotiators to tempt Israel into a deal by conceding more and more ground, while pleading in vain with U.S. officials for help. And in the longer term, they could even prove politically fatal to chief Palestinian negotiator Saeeb Erekat and his boss, Palestinian Authority President Mahmoud Abbas," according to Time's analysis. The magazine breaks down what the papers could mean for the peace process. President Obama, Congress and the nation prepare for tomorrow night's State of the Union address, and CNN.com Live will be there for the president's remarks and the Republican response. 9:00 am ET - Detroit police shooting briefing - Four police officers were wounded Sunday in a shooting inside a police precinct station in Detroit. City officials hold a briefing on the incident.